Are you Looking for the Perfect Award Winning Hotels in La Ceiba? There are several award winning hotels in La Ceiba that are well worth staying in! There are three different awards that I can come up that are important to hotels. Few hotels in La Ceiba have received this recognition over the years. 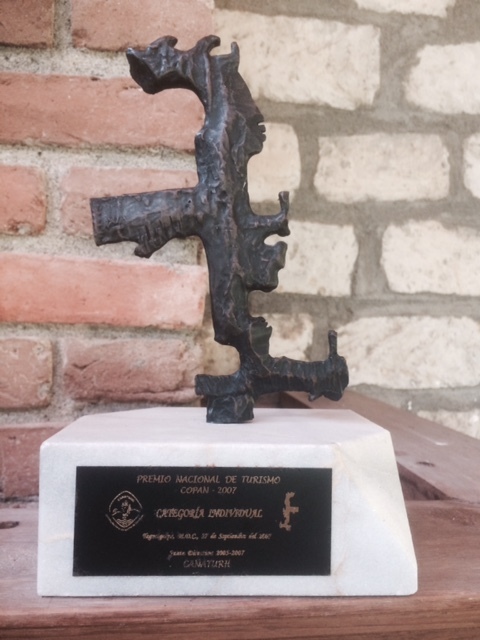 The first, and most prestigious tourism award in Honduras is the Copan Prize. This prize recognizes businesses and entrepreneurs that play a unique and significant role in the development of tourism over the years. The Copan Award consists of a small bronze sculpture that resembles a Mayan “excentric”. This is a unique archaeological piece is a kind of scepter that only the most powerful kings had. Archaeologists have found less than a dozen and a half Mayan excentrics. Most of them come from the Mayan site of Copan in Honduras. In La Ceiba, only a handful of hotels and entrepreneurs have received this prize. Amongst them, the Lodge at Pico Bonito and the Palma Real Resort. The award was given to John Dupuis in 2007 for his outstanding work as editor and publisher of Honduras tips, and it can be seen proudly displayed at his unique bed and breakfast, La Villa de Soledad, located in the Cangrejal River Valley just outside of La Ceiba. La Villa de Soledad in fact, is one of the most award winning hotels in La Ceiba. We received the 2014, and 2015 Travelers Choice Award by Tripadvisor. We also got the 2014 and 2015 Certificate of Excellence by the same company for outstanding reviews by guests. Booking.com also gave us their guest review award in 2016 for our outstanding service! We thank all our kind guests for sharing their experience in the different social media and travel outlets! La Villa de Soledad B&B is a unique boutique property where you are personally attended by the owners, Soledad and John Dupuis, a couple who thrive as innkeepers and hosts at their small 5 bedroom boutique bed and breakfast. If you are looking for a small, cozy and truly unique place to stay in while in La Ceiba, then La Villa de Soledad B&B is the perfect choice among the different award winning hotels in La Ceiba. There is no doubt that La Villa de Soledad is the best rated hotel in La Ceiba! Check them out you will be happy you did!